Tonight is my last night at home before heading towards PAX. As such our world pretty much revolves around packing up the things that need packing and cleaning the house some more to make it nice for the house sitter. I think at this point I have everything that I am going to need to both enjoy and “work” pax. This is going to be an odd experience for me, because in theory I am the eyes and ears of MMOGames.com during the course of this trip. In addition to that I am going to try my best not to let my streak of daily postings slip either. As such I am writing this and planning on posting it in the morning… which while cheating is something I have accepted in the past. In truth most of my posts during this trip will be along these lines as I intend to write up what I saw during that day from my hotel room. The oddest experience for me is that I am going to have some actual media appointments, as in sit on the couch and talk to devs about their games. I have a ton of questions, but at the same time I am feeling extremely self conscious. Its like I am expecting them to immediately realize that I am not really a professional writer, and get kicked off the couch or something. Sure I blog each and every day, and that has been one hell of a marathon, but for whatever reason this suddenly seems that much more real. I would love to be doing stuff like this for a living, but I learned long ago that writing simply does not pay enough to even come close to offsetting the salary of a programmer. So instead I will just pretend to be a “legitimate writer”, and simply be thankful that someone is letting me indulge that fantasy. For the several quarters it has seemed to me that Elder Scrolls Online and Wildstar were like two kids sitting waiting on the bottom of a pool. Each of them trying to hold their breath as long as humanly possible before admitting defeat and swimming to the surface. 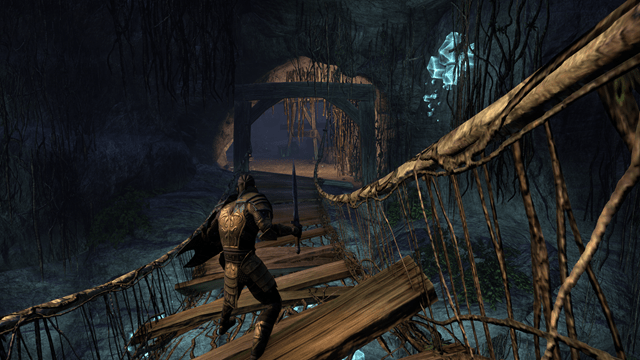 Today Elder Scrolls Online swam to the surface and admitted defeat, announcing that they would be abandoning the subscription model in favor of a new “buy to play” strategy with an optional premium subscription. That said I absolutely expect Wildstar to swim to the surface themselves rather quickly confident that they won this game of chicken… but no less battered for the challenge. This was the year that the subscription model gave its last hurrah, and ultimately proved that the buying public simply was not willing to pay on a month my month basis. I say this but it is not entirely true, given that World of Warcraft, EVE Online, and Final Fantasy XIV are each doing better than they have in years. The subscription model is still very much alive and kicking, but unfortunately the folks willing to pay a monthly fee… seem to already be committed leaving only the game hoppers and nomads shifting from title to title. Awhile back I wrote an article calling Elder Scrolls Online my disappointment of the year… and in many ways it still very much is. That said I hate to see them having to shift payment models like this. I still like the idea of a subscription, but a game has to earn the right to see my monthly payment. Final Fantasy XIV does this by providing a constant stream of new content. World of Warcraft earns my dollar by simply being the first breakout hit to claim the market share and thus addict swarms of my friends who refuse to leave it. Elder Scrolls Online just lacked the glue to keep me playing, and after my initial six months worth of subscription time I let my account go dormant expecting to play again when it hit the consoles. Don't like pay to win air drops, or overpriced early access schemes? We got games we deserve for not being willing to pay subscriptoins. Today I made a tweet, and as luck would have it my fingers got faster than my brain… and it of course has a typo. That said I pretty much stand by the statement… once corrected for spelling of course. Game Companies are after all companies. Developers, Designers, Artists and Writers all have to get paid for their work, and at the end of the day no one can afford to work for free. Hell I couldn’t do half of the stuff I did with my blog, podcasts and the sort without a really nice paying job to back me up and fund my hobbies. At the end of the day these companies have to make money, so they can turn around and invest in those resources that support their games., and that’s not even taking into account the serious costs associated with keeping up a server farm. Sure single servers are relatively simple and cheap to operate… but when you are talking an online game you are literally talking about thousands of servers working together to maintain the structure that we demand be not only up 24/7 but also be relatively lag free. So if we complain about blatant money grabs like the air drop scandal in H1Z1, or the constant limited edition loot box bonanzas in Star Wars the Old Republic and Rift. We have to realize that all of it is entirely our faults. The subscription model was nice and honestly and for the most part was a contract between the players and a company. We pay them to keep rolling out new content, and keep the lights on… and we would get to play their games. However at some point during the line that contract was broken, and we the players started wanting more for free. I have gotten so tired of seeing comments like “I like the game, but I will play it when it goes free to play”. If you like the game, and want to play it… you should be willing to support it. I’ve subscribed to games for months after I stopped playing them, just because I believed in the mission of the company or the game. If we don’t help the companies… they are going to keep taking progressively more desperate measures to try and stay afloat and keep making salary. I will be the first to admit that steam early access or paid alpha and beta programs are frustrating riddled with problems. Ultimately I feel like that extra transparency bogs down the process and ultimately produces a confused product designed by committee. The problem is… we are quickly becoming the investors in the games we are playing. Why are we now investors you might ask yourself? Essentially the repeat failure of AAA MMOs means that a lot of the institutional funding is simply not available. Would you want to fund an MMO after the state of Rhode Island was stuck holding a multi-million dollar bill for the failure of Copernicus? Kickstarter has been an interesting catalyst for games development. It has placed a power in our hands that we have never had before… and it is not entirely a good thing. As investors… we feel entitled to have our say in the way the process works. I honestly miss the days when I could look at the games industry like it was some magical engine of creation. When I could view it as being something that simply turned out the games I wanted to play without any real consequences attached to it. The problem is… I know the consequences in the faces of friends that have been effected by the closure of studios, and the “cutbacks” in staffing as subscriptions faltered. How do you build a family when you aren’t sure where you will be living in six months? Maybe I shouldn’t care about the human costs behind these things, but unfortunately that isn’t really a luxury I have. I write my blog and I make my quips, but at the end of the day I have nothing but the utmost respect for the folks that make the games I care about. I can be petulant just as much as the next person, but sometimes I lose sight on the truth behind it all. They make the games that we are supposed to have fun playing… and in doing so it is up to us the players to uphold our end of that bargain. I am not addressing the people that didn’t enjoy a game, because that is the way it works…. I am talking about the folks that loved a game… but were unwilling to subscribe. I am mostly not a fan of the F2P model as done in most games. And unfortunately now in a lot of them even subbing doesn’t offer much beyond the basics. Although this will finally let me try ESO out and see if its worth my sub money.